Having recently moved, I have found space to be at an even higher premium, and being I am spending most of my time at work or with the other half, I wanted to get back in to the hobby, but had to down size, and down scale. the base board is already built and I have started to collect a few items, but may be after christamas when results may be seen. Which track is the entry track, and is this a single line layout. If it is I assume the middle track is the mainline. I ask as the top line can only access the main platform, the middle all tracks, and the lower the top bay. Good start and I like the Western. Looks good in blue livery. the layout will show the last few platforms of a much larger terminal, so I could get way with any line in or out, but the main idea is top line is passenger and parcels in, middle line is passenger out, bottom line is a parcels head shut line that would join the main line off scene so can be a parcels in and out. the station from top to bottom goes passengers in platform, passengers out platform, pilot/loco/van bay, parcels platform, opposite the parcels platform is a short storage line. 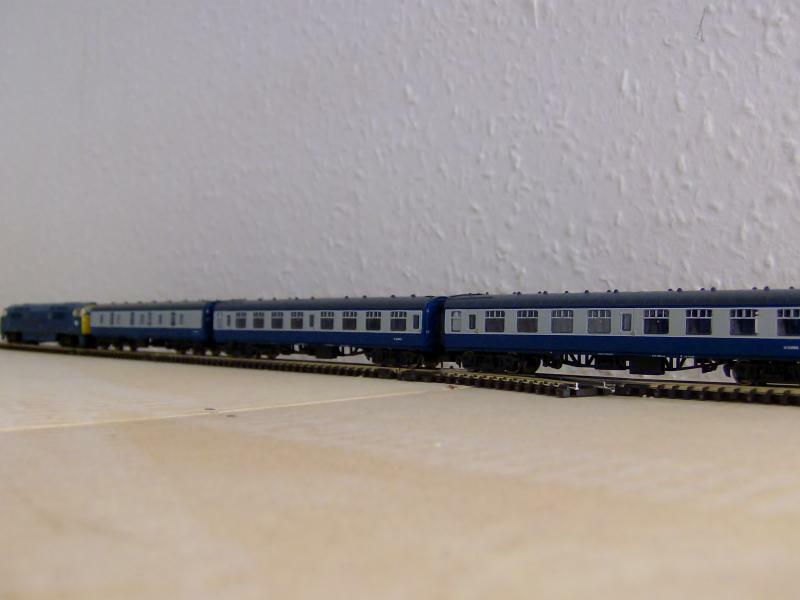 the layout will heavily use a station pilot which I hope will be a class 22. The bit I really miss is the lack of a run round loop of some form - It will now be fixed by the use of the traverser, and the head shunt. The lesson I've learnt, is pin the track down (or for N you could use bits of double sided tape) and play - sorry test the track plan prior to fixing permanently down. 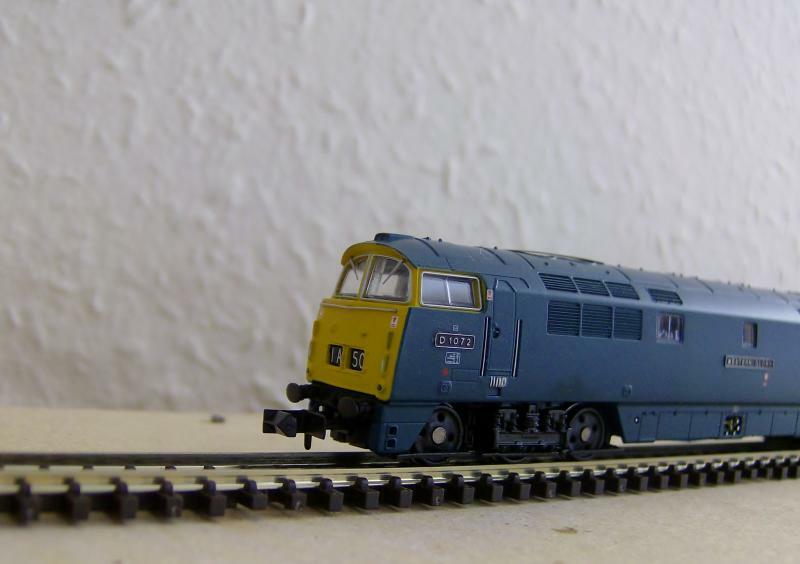 But I've gotta ask, what have you done with the OO gauge version? Ed wrote: Nice plan Aaron. 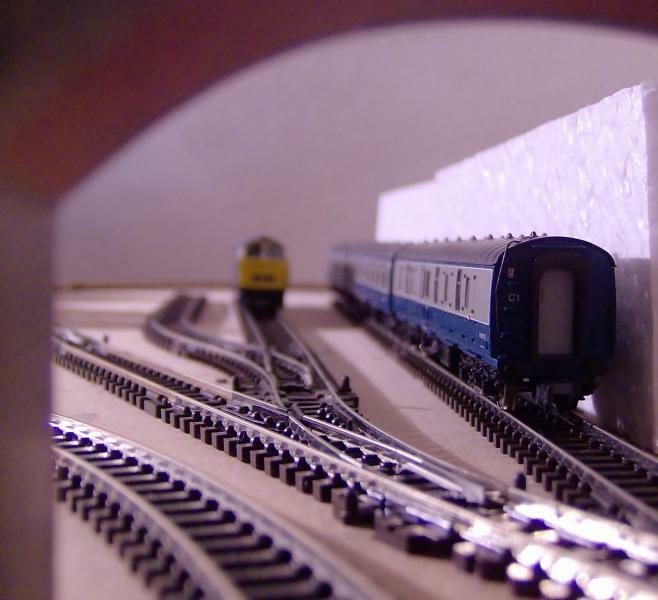 Nice Thread by the way, I really like the raising the track level, I've been tempted to do the same thing and have been stashing polystyrene under the bed from flat pack furniture for the very purpose. 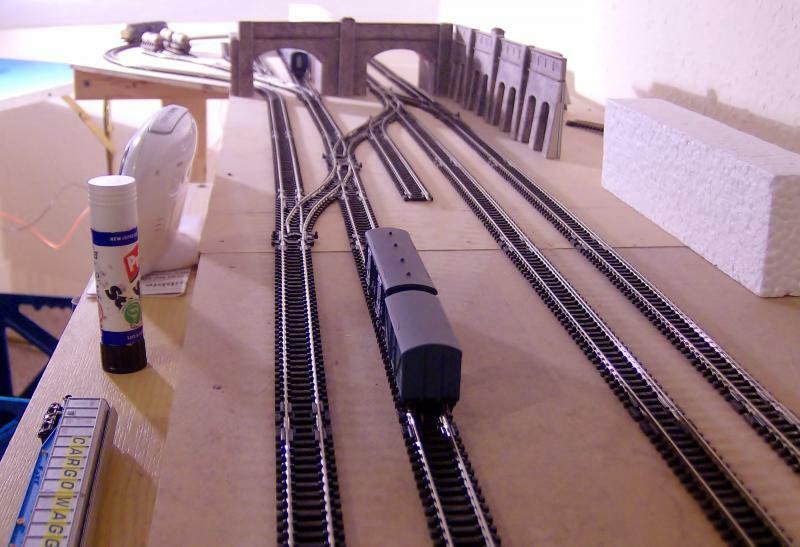 my 00 gauge kingsmead never had a run round loop, which at first I found a bit annoying, but after creating a few isolated sections and heavy use of a station pilot made for some interesting shunting. I used a sheet of 2" insulation, then cheated and used a band saw to cut it into strips to give me the correct height. If you are going to do the layout elevated, I suggest you take each dropper from the rail below the base board. I connected the feeds together before passing below the base board. Now if I wish to install block detection etc, I will have to rip away the retaining walls. Doh !!! 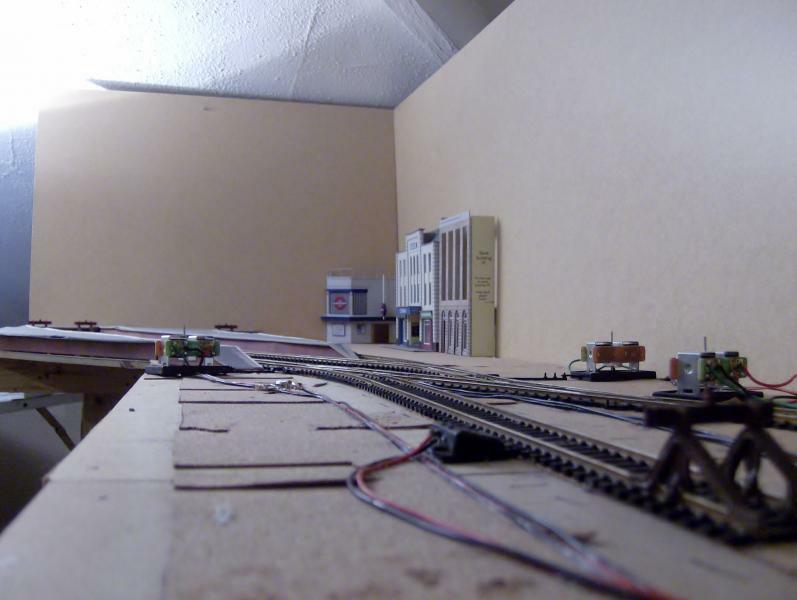 Fiddle yard is the dashes track, terminus station with three platforms on right hand side, a goods line, stabling point and coach storage line on the left hand scenic side. This track plan will allow me to do most things I want to, The running of short goods trains such as dairy , fuel and vans, small amount of parcels to be handled during quite times, three coach trains, locos on display at the short pilot track and at the stabling point. Thats a good improved running plan Aaron. Great photos and best of luck with the build. It's looking good. Especially the last shot with the 22. A particular favourite of mine. Best of luck with the rest of the build. it's all change at Kingsmead, After going into the model shop at Swindon to buy some N Gauge kits, the girlfriend stated that she much prefer 00 gauge and would love to build some of the Metcalfe kits, well that thru a spanner in the works and enticed that niggle thought I had in the back of my head, "why don't you swap back to 00 gauge", so after a five minuet think in the shop I thought why shouldn't I, already got most of the stuff. So upon arriving home that day I drew up a track plan, I hold no credit from this as it is a HUGE rip off of Victoria Park, Ian Futers 0 gauge micro layout, featuring in Railway Modeller, December 2009. 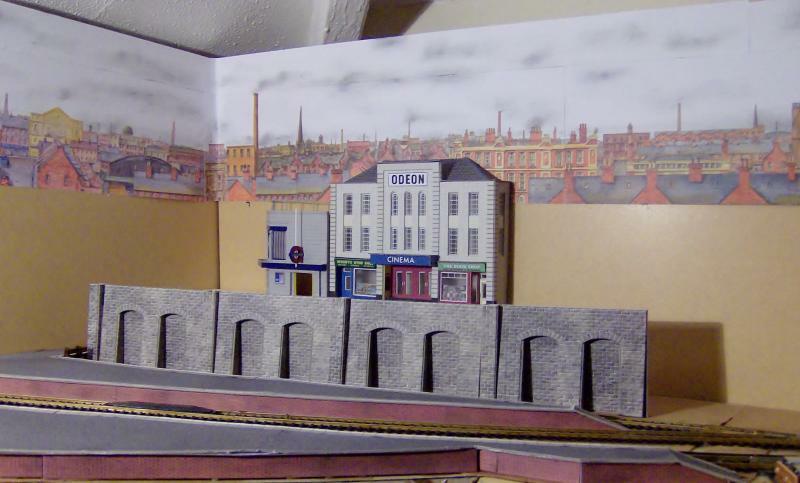 I also drew inspiration form South Oak Road, John Wiffen (scalescenes) 00 gauge mirco layout for which there is little trace of left on the internet, But I was a huge follower of the Feed when the layout was progressing back in 2009, 2010. 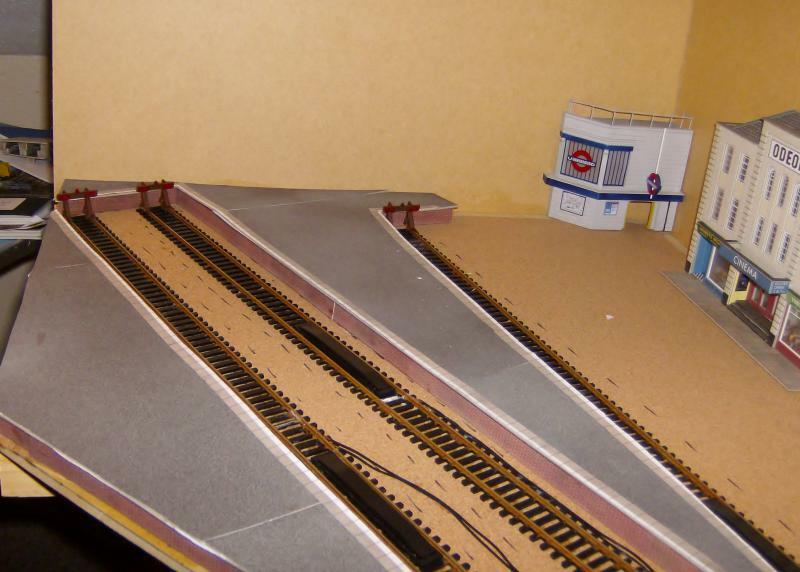 The layout Is incredible basic, on the right hand side is the off scene fiddle yard and control area, to the left hand side is a three platform station which has seen better days and has been reduced to mostly parcels traffic and the DMU services (when I buy a class 121/122 when released) there's also a kick back which will be used for stabling locos and pilot. For the first time I decide, that this time I'm not going to half hash it up, and so upon receiving the track, I proceed with painting the rail sides with a dark umber, then I laid the track, and for the first time, proceed to place and wire up point motors once the layout was completed wired up with point, isolation sections and power points, I built the platforms and half built the cinema with the other half, I have also added uncoupling ramps for complete hand of god free operation, another first for me . 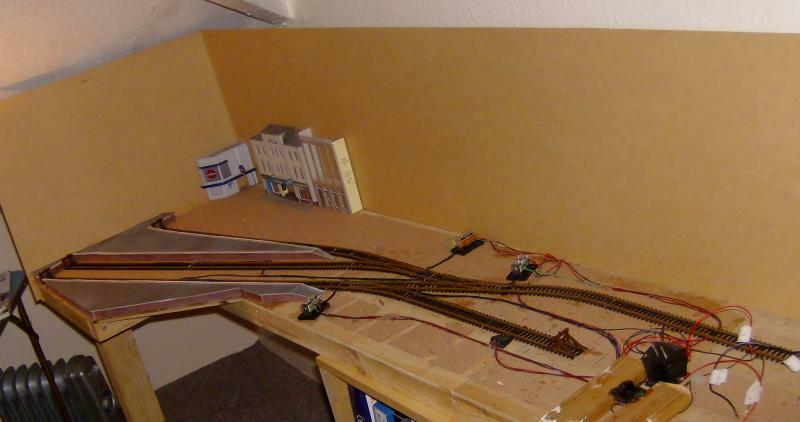 A view from the buffer stop of the stabling siding, all wiring and point motors are top of the board mounted, I found this easier,, two of the motors will be behind the retaining walls and below the street scene, only one point motor will require a clever disguise. 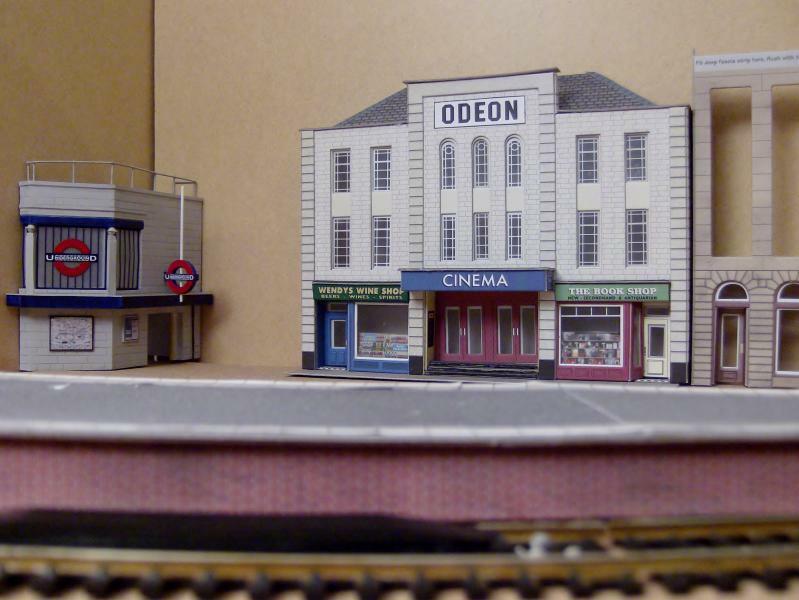 The cinema and the tube station which I picked up at a bargain price. I was wondering if one of the moderators would be kind enough to update the scale of the thread from N to 00, I didn't want to clutter up the site with another thread, and thought it best to press on with this thread. Ed wrote: Welcome back Aaron. It's all been boxed up and put into storage, the great part about N gauge is that it doesn't take a lot of space to store it all, I will most likely recycle the Retaining wall as bridge supports. You Never know, I might even find space for a N gauge layout on the side, But I wouldn't expect that for a good number of years. Just a quick update, town scene back scenes have been mounted and an attempt at clouds has been made by smudging pencil graphite on the paper by hand, also first kit of retain wall has been built, the buttresses have been cut down and the top walling hasn't been added yet, this will have to wait until the street level has been properly raised up, at the moment the cinema is standing on two blocks of polystyrene.